Mix two tablespoon of cornflour with about three tablespoon of water and make a thick batter. Sprinkle about two teaspoons of cornflour over the quartered eggs. Now, dip the quartered egg pieces into the batter of cornflour and fry it in the oil till it turns golden brown. Cook on medium flame. Once done, transfer the fried eggs to a paper tissue and keep it aside. Now heat two tablespoon of oil in another pan and add dry red chillis. Saute for a minute. Then add chopped ginger and garlic. Saute for another minute. Add the chopped spring onions, red chilli sauce, soy sauce, salt, honey and lemon juice. Mix well and saute for 3-4 minutes on medium flame. Now add the fried egg pieces to it and mix gently. Add one tablespoon of cornflour batter and mix well. Cook for 2-3 minutes and then switch off the flame. 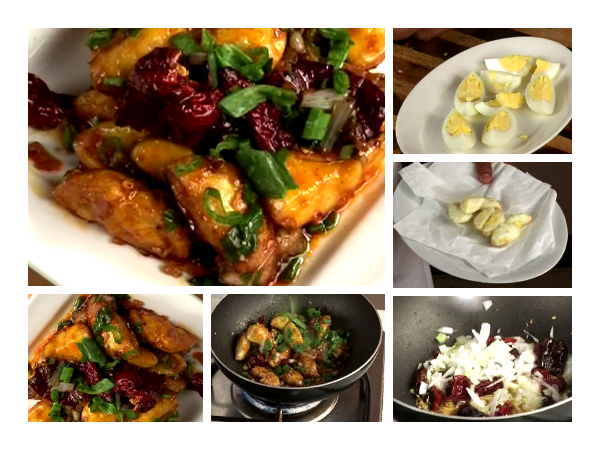 Once done, transfer the crispy honey chilli eggs to a serving plate and garnish with chopped spring onions.